Are you trying to find the best mattress for the buck near Louisville, KY? We’ve done some research to help you out. Sagging or lopsided mattresses, as well as discomfort upon waking or during sleep are obvious indicators that you need a new mattress. If this is you, and you’re feeling uncomfortable, unrested, or stressed during your day. A small study from the Better Sleep Council found that switching to a new mattress resulted in more restful sleep, lower stress, and back pain relief. In addition to the cost of a new mattress, however, finding the best place to buy a mattress can be a significant hassle, and potentially one of the reasons that most Americans replace theirs every 10 years, rather than every 8 (as experts recommend). So we’ve simplified the process by compiling a list of the best places to buy a mattress in Louisville. 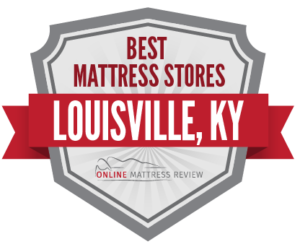 Our guide is based on reviews by actual customers, and broken down by geographic region around Louisville, KY. Read on to find the best mattress store in your neighborhood or region, and make your mattress upgrade a smooth and convenient experience. Heather’s Furniture (2901 Dixie Hwy) stocks a wide selection of furniture, appliances and mattresses, making this store a great option for those looking to furnish a new home in a single outing. Heather’s offers Isolated Coil, Foam and Memory Foam mattresses from affordable mattress brands like brands like Simmons, Corsicana and Symbol. Further South, Chuck’s Mattress (1853 Berry Blvd) is another independent mattress store, this one a small mom-and-pop mattress shop, where customers report finding excellent deals on affordable mattresses, though the selection is smaller. Still another family-owned mattress shop in central Louisville is Louisville Mattress (5900 Preston Hwy), which boasts 20 years in the bedding business and a 4.8-star Yelp and Google average review. Louisville Mattress emphasizes value, and customers report satisfaction with the blend off high quality and low cost of their beds and adjustable based, as well as the professional service in the locally-owned establishment. Louisville Mattress Center (6200 Preston Hwy) boasts a five-star average Yelp rating, and is known for offering highly affordable mattresses in a no-frills, outlet setting. This also locally-owned mattress shop has been in business since 1987 and offers warehouse pricing, selling mattresses at 60-70% off retail. If you’re shopping for a new mattress in Louisville up North, head northeast to Springhurst. Here, you’ll find no less than seven mattress shops, making for convenient comparison-shopping. There are three national chains with mattress store locations in the area: Mattress Firm Clearance (10331 Westport Rd), Sleep Number (10602 Westport Rd), and two branches of Sleep Outfitters (10494 Westport Rd and 10519 Fischer Park Dr). All have strong reputations for wide selection and knowledgeable staff, though Mattress Firm Clearance has the highest overall online review rating, and the greatest number of reviews. At this Clearance outlet of the Mattress Firm chain, customers can score serious discounts, picking up affordable mattresses from closeout and discontinued stock, as well as slightly imperfect mattresses or those which have been exchanged by previous customers within that store’s 120-day return window. In addition to national chains, there are also several local mattress stores in Springhurst: Bowles Factory Direct (3545 Springhurst Blvd), Mattress and More (10459 Champion Farms Dr), and iDeal Furniture of Louisville (3747 Diann Marie Rd). Of these, Mattress and More has the greatest number of positive reviews, with customers praising the selection, prices and staff, who are said to be knowledgeable and patient, and who never exert sales pressure. There are fewer places to buy a mattress in south Louisville than in other parts of the city, but shoppers here do have a few strong options in the Okolona neighborhood: Sleep Outfitters (5009 Mud Ln), Mattress Firm Clearance (4915 Outer Lp), Mattress and More (5016 Mud Ln), and Denver Mattress (7855 Preston Hwy). Sleep Outfitters is a national retail chain showcasing a wide variety of brand-name mattresses, plus sheet sets & accessories. Mattresses and More, on the other hand, is a local chain. This mattress shop stocks mattresses from Sealy, Tempur-Pedic, Restonic, Stearns & Foster, and many more trusted names, along with adjustable beds, pillows, sleep accessories and bedroom furniture. Denver Mattress, another chain, sells top name brands , as well as “Doctor’s Choice,” their in-house brand of more affordable mattresses. Denver Mattress Company has been in operation since 1995, and makes a charitable donation for every mattress purchased. There are a number of places to buy a mattress in East Louisville located right off Highway 60. One option is Bowles Mattress Co (12401 Shelbyville Rd), a family-owned business with several mattress stores in Indiana and Kentucky. Bowles sells high-quality mattresses, mattress protectors, daybeds, headboards, rollaway beds and bed frames, all built in their Kentucky-based factory with American-sourced materials. Their mattresses feature enhanced spring systems, high-density foams, performance materials and meticulous handcrafted-build standards, all of which add up to a longer-lasting product. Another longstanding local store selling mattresses and furniture is Burdorf Interiors (401 N English Station Rd). This larger furniture and mattress store sells Latex, Foam, Memory Foam and Gel Foam mattresses, along with such bedroom essentials as Adjustable Bases, Headboards, Bedding, Mattress Protectors, Mattress Toppers, and Pillows. Another East Louisville furniture and mattress store is Bassett Home Furnishings (12941 Shelbyville Rd), which boasts a large furniture inventory, as well as Tempur-Pedic, Sterns and Foster, and Sealy mattresses. Basset offers white-glove delivery, which includes assembly and set-up, and supports a number of environmental initiatives and local charities. Local chain, Mattress and More (6801 Dixie Hwy), has a five-star online review average from a large number of satisfied customers. Most reviews cite the impeccable professionalism of the sales staff, though reasonable prices are also another important reason that shoppers love this mattress store. Mattresses and More has a wide selection of name brands, as well an extensive clearance section. Nearby, Bedzzz to Go (7301 Dixie Hwy) also has an excellent reputation. This independently-owned mattress shop is known for sales associates with serious sleep expertise, as well as their wide selection of mattresses and accessories, which includes Fashion Bed Group, Glideaway, Leggett and Platt, Protect-A-Bed, Serta and Serta iComfort, and Symbol Mattress. For those who prefer the reliability of a chain store, there’s a Mattress Firm Clearance (5346 Dixie Hwy) and a Sleep Outfitters (6515 Dixie Hwy) in the area as well, both well-reviewed. Sleep Outfitters is a national chain selling brand-name mattresses, where specialists provide each customer with a personalized Sleep Assessment to formally evaluate their comfort preferences and sleep style to match them to the ideal mattress.